Well it must be spring because I hit the field today to test some boomerangs. It was typical for this time of year, temps in the mid 40’s, mostly cloudy and winds blowing about 15mph. Probably not the best day but doable. The field conditions were typical for spring too. Very mushy under the mostly dead grass. I felt like I was walking on sponges. Needless to say I wasn’t running around chasing boomerangs. Let them land were they land and pick them up. My knees and ankles cause enough problems without me messing around on squishy ground. Everything I tested flew well, even though many tosses were blowbys. That 15 mph wind has a way of affecting fligh. 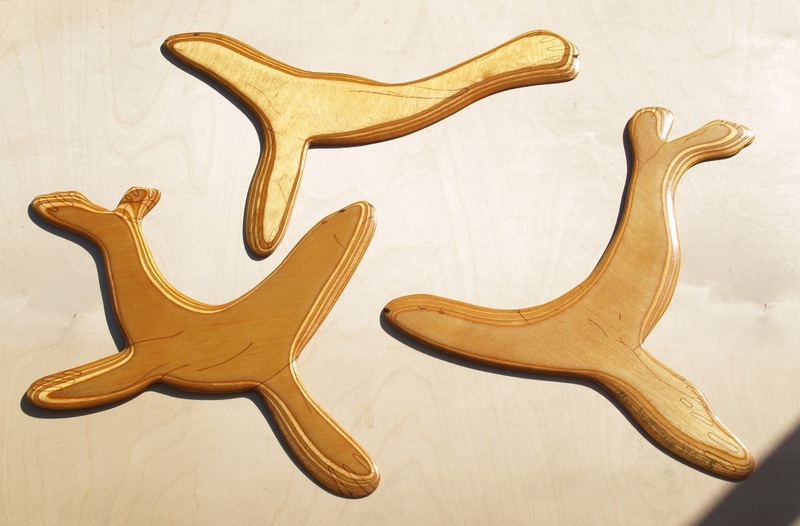 I was most anxious to test the MDF boomerangs I received to use for my Australia class. These were originally made by Hasse Lindberg in Sweden. He originally sent them to David Fantone in Oregon, who sent the leftovers to me. They flew very well so I am happy to have them for the students to use. 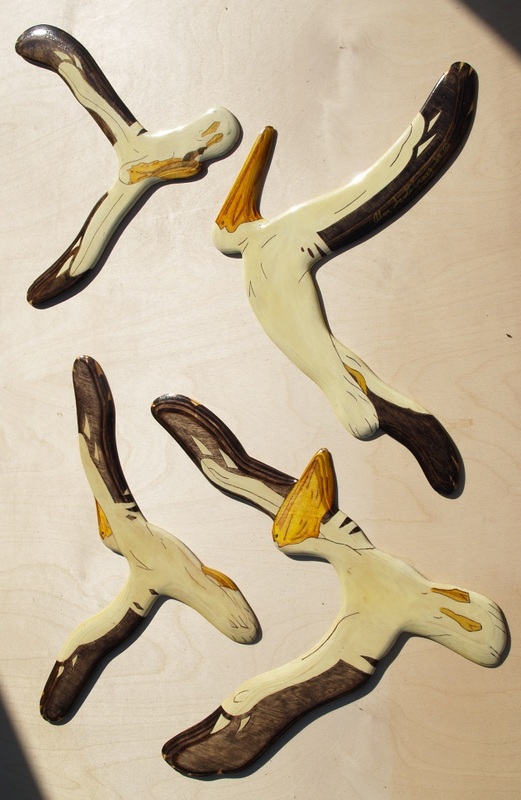 The other boomerangs I had for testing were orders for customers which have stacked up in backlog over the winter. Well, it was good to see stuff flying again. Today was the first session of my Sacred Heart School/Computer Aid exploratory class for Eighth graders. The class is called “Australia: The Dreamtime and Boomerangs”. I am assisted by my coworker, Hector Vazquez. We started with an overview presentation on what would be learned over the next seven weeks. we also covered the grounds rules for conduct and participation. The students appear to be very enthusiastic. Then I openeg my bag (actually a box) of tricks. I had brought quite a few various aboriginal pieces to show. I had clap sticks, 2 nulla nullas, a shield and a number of both kylies and boomerangs. I think it was fun to let them pass the items around, to hold and touch each item. It made the experience more personal for them. I was pleased that the students had many questions. 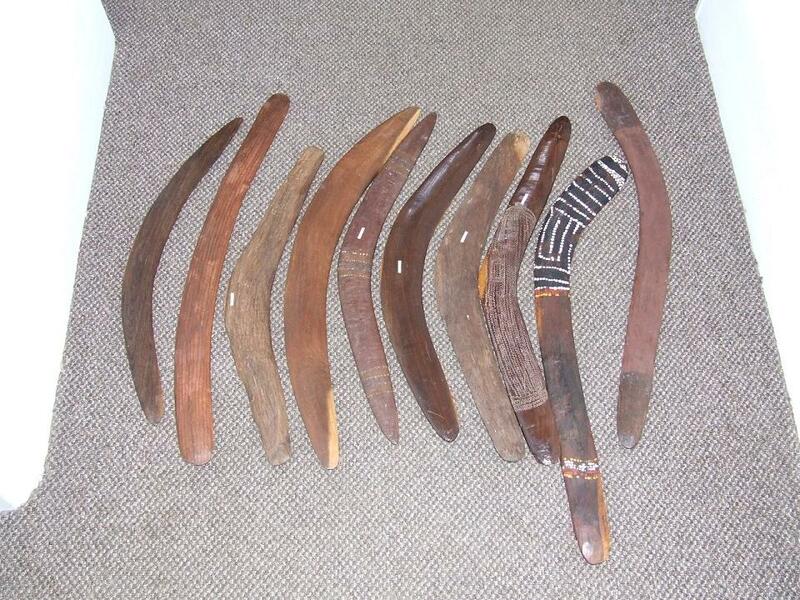 Then I moved on to modern boomerangs. I had a bunch of boomerangs and realized I could have brought more. The students were very interested in the various shapes and were surprised that they all returned. Of particular interest were the bat boomerangs made by former Sacred Heart student Ian Guldner. Ian went on to high school and is now a college graduate. His boomerangs were made as part of class project in high school. He entered them in the USBA National contest and won. I had qute a few art boomerangs including some pieces by Alan Scott Craing which I recently obtained. 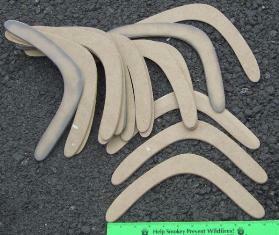 I also showed boomerangs used for competition in fast catch, MTA, Long Distance and Aussie Round. We had to move on so I began the presentation on Aboriginal art. We reviewed the symbols used and what they represented. Then we viewed a number of photographs of Aboriginal art and tried to figure out what was on them. From there we moved to a presentation on what the Dreaming or Dreamtime is and how it came to being. We ran out of time at this point so got the students back to the bus and went back to work. Our next few weeks will be fun because the students already have loads of questions which will be answered in future sessions. Yes, it has been a long time since I have last posted to the blog. I got busy and the weather got cold. Once it’s cold I shut down all boomerang activities. With us rolling into March, there is a chance to make boomerangs as soon as the temps get a bit higher. That’s a good thing because I am developing a backlog of boomerangs to produce and i have a craft show the end of April. I’ll need shop time! Also it is only two weeks until I begin my exploratory class for 8th grade students at a local school. This is the third time I’ll be doing the class. The class is called “Australia: The Dreamtime and Boomerangs”. In the class the students learn about the Aboriginal culture thru the Dreamtime stories and art. They also get to try to make their own Aboriginal art, make boomerangs, and make PVC didgeridoos. They will listen to some Australian music and study the science on how boomerangs work. Lots of fun but some real learning opportunities too. The class happens at my employer’s office and is scheduled from noon to 1pm each Thursday. We’ll have 7 sessions this year. I look forward to the class and working with my coworker, Hector. This will be Hector’s third time too. Now I should look over my class lesson plan and make a list ot things I need to get ready in the next 2 weeks. First class is March 21st. I’ll be posting weekly updates after the class.